Photo courtesy of Associated Press // France celebrates after Paul Pogba scored in the second half. 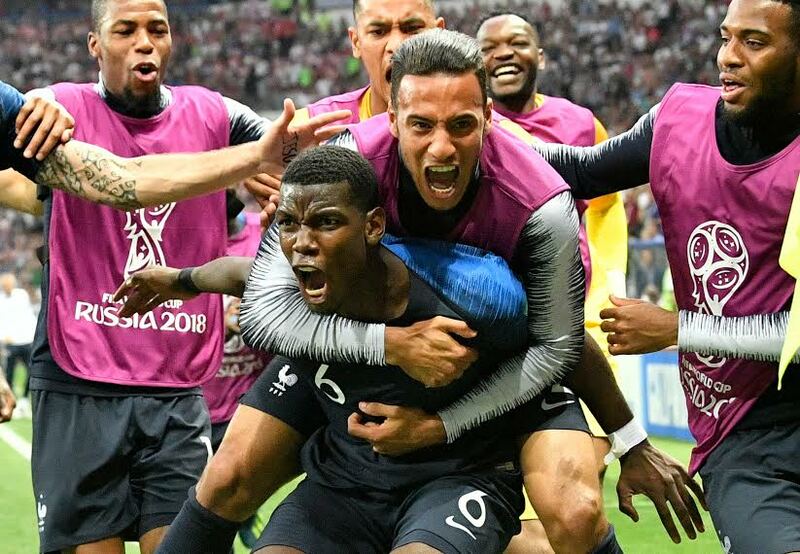 France snatched its second World Cup championship title last Sunday when they defeated the underdog team Croatia 4-2 in the 2018 World Cup. The game opened with Croatia showing up France on the offensive side, but were unable to reach the net before France, who put the first mark on the board with a free kick goal by Antoine Griezmann in the 19th minute. Fueled by Griezmann’s goal, France began to play more aggressively by taking an offensive approach, though a yellow card on Ngolo Kante of France gave Croatia the upper hand. The resulting free kick allowed Croatia to send the ball to the net, evening the score 1-1. The even score didn’t last for very long, however, when France’s Antione Griezmann was awarded a penalty kick and sailed it into the corner of the net for his second goal of the game in the 39th minute. The score remained the same as the teams broke for halftime. As the second half started, both teams seemed to be playing to score. France gained possession at the beginning of the half, managing to take the ball all the way to Croatia’s end but falling short of a goal due to a save by Croatian goalkeeper Danijel Subasic. Croatia then regained the ball and kept French goalkeeper Hugo Lloris on his toes for several minutes in the second half. In the 55th minute, French manager Didier Deschamps made an unexpected roster change when he took out one of France’s most valuable players thus far into the tournament, N’Golo Kanté. Kanté was swapped out for Steven Nzonzi. Four minutes later, France would earn its third point of the game with a rebound goal by Paul Pogba after his initial attempt was blocked. Energized by his team’s success, up-and-coming France teenager Kylian Mbappé made his presence on the field known as he gave France what would be their final and winning goal of the game. With Croatia down by three and the clock running out of time, Croatia needed to score. Mario Mandžukić gave Croatia their final goal of the game in minute 69. Croatia certainly put up a fight with the remaining 20 minutes of the game, but fell short and failed to even out the score. Despite impressive determination from both teams, France’s experience came out on top over underdog Croatia in what is sure to be a historic World Cup.